Margaret McAngus died 9th January 1937 aged 56. Son William Sutherland died 27th April 1953 aged 38. 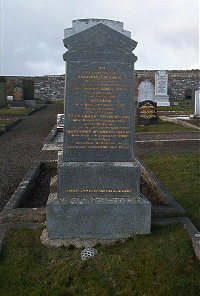 Husband Alexander Sutherland of Braehungie died 14th August 1956 aged 90. Granddaughter Margaret McAngus Grant died 7th February 1950 aged 1 daughter of David and Catherine Ann Grant. Erected by her husband and family.